OK, this my seem like a stupid question, but I gotta ask. Are you supposed to mount the hood shelves and then assemble the hood clips, springs, washers and cotter pin--or are you supposed to assemble the clips to the hood shelves and then bolt the assembly to the frame. I will tell you why I am asking after I hear some responses, because I spent a few aggravating hours yesterday getting everything together--maybe I was doing it wrong, maybe the repo parts are not right. Chad; We always do it with two man,one is holding the clip in the right direction on the top, and the other [me] is pushing the spring and washer from the bottom with the screwdriver together and put in the cotterpin . For me, since I work alone, it's easier to assemble the hold-downs on the hood shelves first then install as an assembly. There are left and right wood blocks so be sure to check. The angle on the block is to pivot the hold-down away from the hood when unlatched. Does anyone use an R clip for this fiddly job :-) ? I assemble mine and then mount the hood shelf to the frame. I do not use the over sized washer because it will not fit thru the frame. I just use the cotter pin. The pin is bent in a circular fashion to be the same size as the spring base and it will slide right in the frame. Test your frame hole by holding just the spring in your fingers and see if it slides in and out easily. The black book also shows them assembled prior to installation. I just took my hood blocks off for the first time and the hood block, wood blocks, and hold down parts all came off as an assembly. If you make the washers small enough to go thru the holes in frame you can put them on as an assembly ,all the original ones i took apart were that way. I also use washers small enough to go through the frame holes. Use smaller cotter pins that can be bent so they match the circumference of the small washer so the head and tails don't stick out past the washer. Many times the springs, especially the new ones are too long. Also, sometimes the wood blocks have the hole drilled on the wrong angle. Good info Guys. It seems everyone does it a little differently. Maybe there is no right or wrong---just whatever works. I bought a repo set of hood clips and stainless springs. 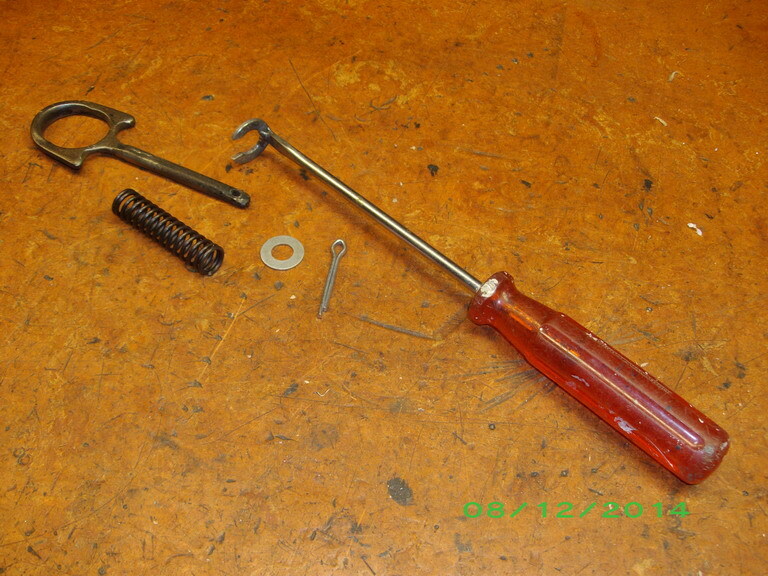 The clips came with washers that were pretty big, and cotter pins that seemed a bit too big and tight in the hole. So what I ended up doing, was to do as a few did above. I used a smaller washer--which required drilling the center to size, then I just slightly opened the hole in the frame up to 1/2". I then used a smaller cotter pin to easily bend it to the same shape of the diameter of the washer. Then I could assemble it as an assembly which was much easier. What I wondered was if the original washer was the same size as the spring or if they used a larger washer like the repo kit includes. It is quite a task for one person to do it after the shelves are on the car using the larger washer. Larry is right - I always found the repop springs to be too long. I cut them down a bit - gives me more slack to get the washer and cotter pin on. No matter how you got at it, it's a pain if you are doing it alone (like Ken, I work alone as well). The original washers are just a hair bigger in diameter than the spring. The washer fits into a counter sunk round hole on the underside of the wood block. The repo washer sold with the hold downs is too large. By the way, the holes drilled are slightly angled, so the shaft of the hold down is at a slight angle for the ear of the hold down to grasp onto the hood. 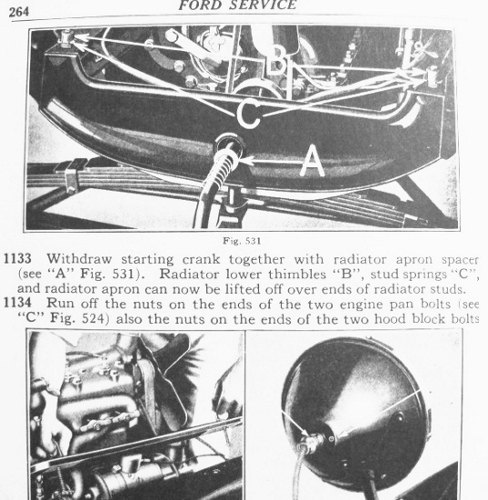 And to allow the hold down to be angled away so as to not interfere too much with you lift the hood. The hood shelf is assembled first, with hold downs, washer, spring and cotter. That allows the assembly to be easily positioned on the fender/frame. Are you saying the washer is on the wood block side and not the end of spring side? That would leave just the cotter pin in the end to hold the spring? Yeah, I didn't understand either. The hole through the hood shelf is smaller then the spring diameter as is the top hole in the shelf block. There is a recess in the bottom of the block the spring goes into. I think Dan may have meant the spring not the washer. I would like to defend my hood clip springs. I made them exactly per factory dimensions except I make them from stainless spring steel because you can't get paint to stay on coiled springs that rub on the clip. The reason I decided to make the springs is because the then current repro springs had too many coils and would "stack" when you pulled up on the clip thus preventing the hood lip from being able to get under the clip without scraping the hood edge. Please be careful not to confuse folks by using the term "repro" and assume that all hood clip springs are made incorrectly. Mine are made correctly but of course they are NOT the cheapest ones out there so they are not the ones that generally get purchased. Many T parts buyers use price as their main criteria when making a purchase. I researched mine carefully and made them exactly per Ford drawings which I purchased. Yes. Post wasn't really clear, Mark has it right. The spring end fits into the countersunk hole in the wood block. Washer behind spring, and cotter to keep the spring loaded against the washer. John, haven't used your mfg. clip springs, just posted older observation made with bought springs. Your are sure to be right my man Having originals to reuse is what mostly done, and sometimes fabricate washer to match old originals for i.d and o.d. 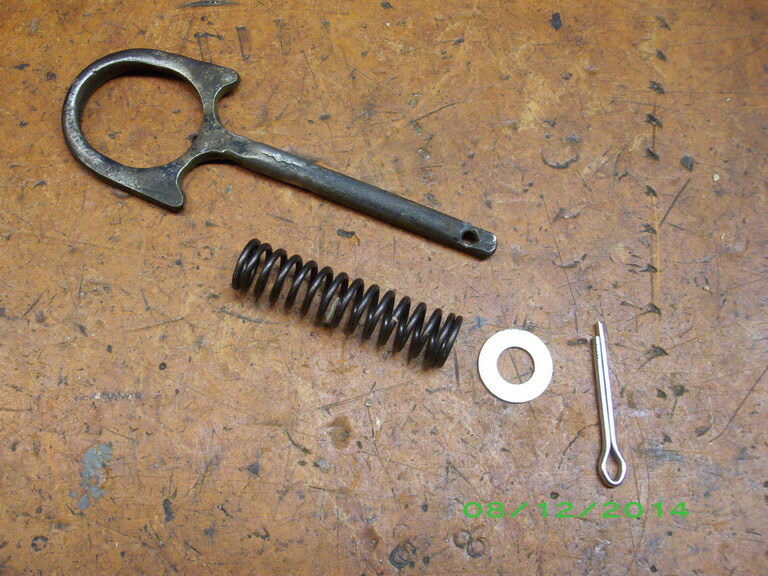 Would you please post a part number for your spring sets and where I can order them. I would rather have the proper set then fight the current battle I have when trying to open and close my hoods. I just about break my fingers every time. I believe my springs are too long and put too much tension on my hood and the hood shelf block. I think if I continue with the improper tension on the hood it will crack the metal at the locking point. Do you think the metal will fatigue at the contact point with too much strain? 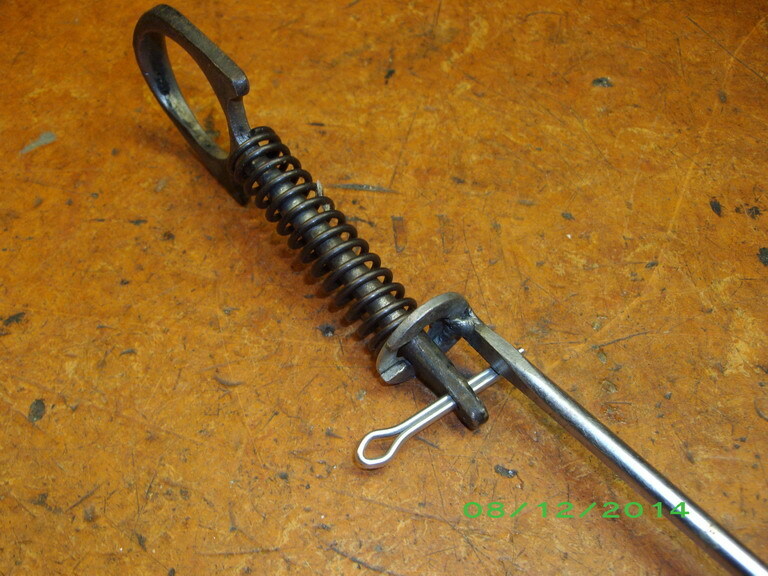 I have a set of Johns springs on my '25, and they are fine. The repro wood blocks can be a problem too. I have had to plug the hole, redrill and re counterbore to work properly. We shouldn't have to do this! Thank you Mike for the link and Larry for the endorsement. I just ordered two sets, one for each car. The wood blocks are fine and I must have the other vendors springs because they make it very difficult to release the hood clips. I will install the Fun Projects spring sets when they arrive. 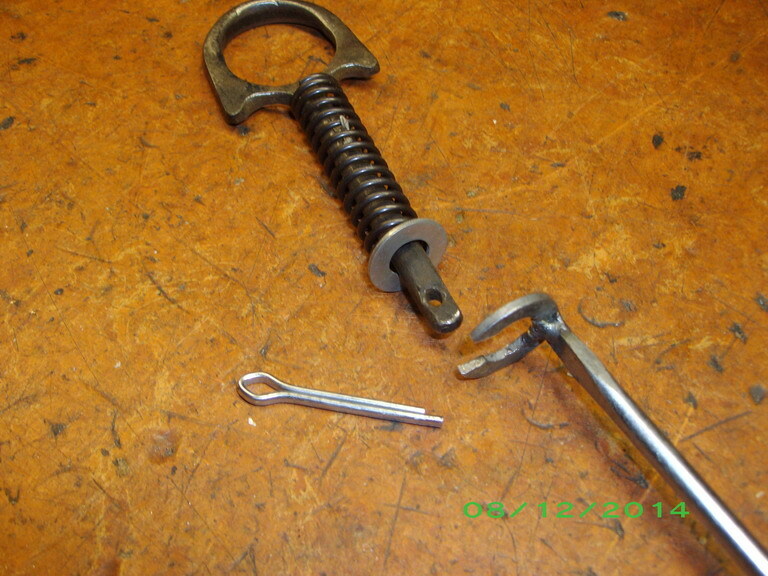 I can attest to the quality and fit of the FP stainless steel hood hold down springs. I modified stainless steel washers & cotter pins to fit as others described. I recall an earlier forum post giving information for reinforcing the lower bead of the hood by inserting a stainless steel rod inside the bead so the load at the contact points is better transmitted to the hood. John Regan, If I seemed I may have complained about your spring, I was not doing it intentionally, nor was my original post meant to do that. I have had ZERO issues with any of your products I have purchased through Langs as well as a few others that go the extra mile to makes things right. My real issue, which I should have been more clear on but wasn't sure what the issue was, is the incorrect washer included with the clips. Maybe John could/would/needs to make correct washers to go with the springs sets he sells? I don't mind paying a little more if the product is made right. I understand most T guys are inherently cheap, you guys should build something like a muscle car so I can here you cry. This stuff is VERY inexpensive for the most part. If only radiators would come down in price, I am sure they would sell a lot more.